Wow thats some sweet service, i didn't even give them my name. Got mine today!!!! wow do they look good, I'll post pics here in a sec!! 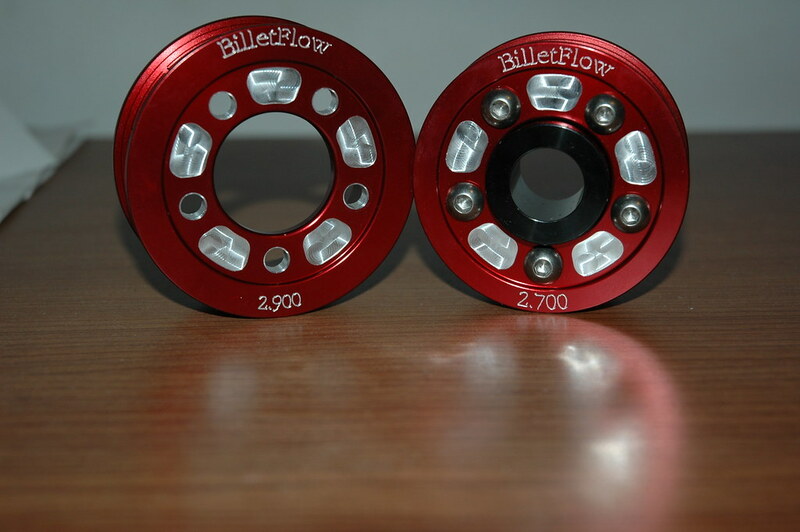 Oh and thank you Billet flow for making such a high quality product and offering great customer service. Exellent Job!!! 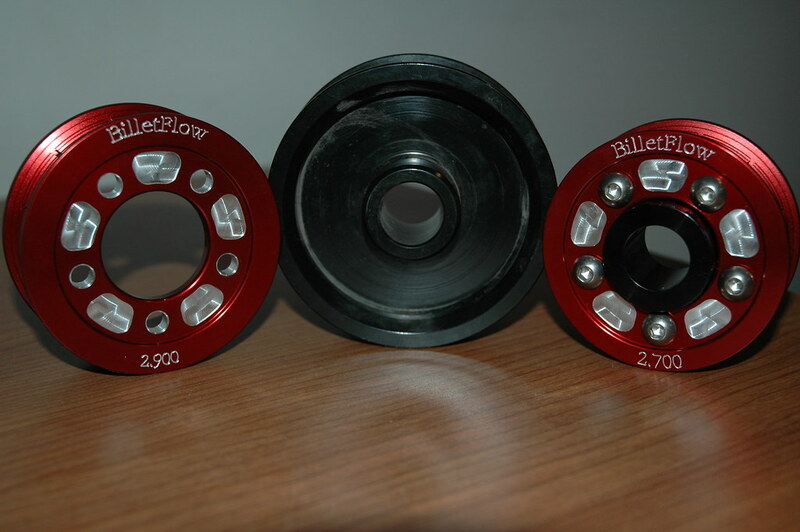 what are you doing about picking up the slack from the smaller pulley? Also, do you think the 2.9 will work with the stock tensioner? I already have a tensioner so that smaller pulley isn't a problem. I think with anything lower than a 3" you need a tensioner. Has anyone tried installing one of these sets yet?? I'm having some problems getting the hub on. someone has it installed on an RL. not sure if it is here on on the redline forum that I saw pics... I think it was a blue pully. how come no one takes pics of the the back side of the pulley, if you could get one of those that would be great. Are you trying to install just the hub without the pulley connected to it? How are you trying to install it,.....what tools are you using? I just got it on, it took two trys with a heated hub. I heated it to 450* F and it slipped right on, before i wasn't heating it and just using the puller pulley like i did on my other pulleys but this one just needed to be done a different way. This is Dave from Livernois Motorsports... Have any pics of a Sunburst Orange pulley around? I may want to get one for my wifes cobalt. Also, do you think the 2.9 will work with the stock tensioner? 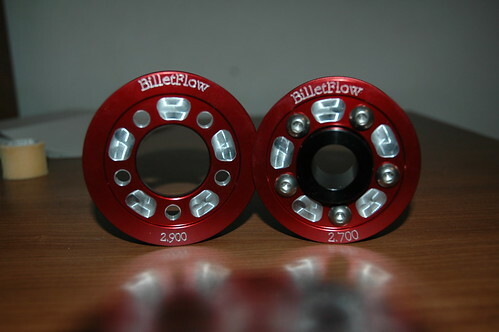 Will the 2.7 fit with no slippage on the GMPP stage 2 belt? Price should be $109.95, I bought a red 2.7 from them and love it. I use the Stage 2 belt no slippage. Great product and great people. Just give them a call to place an order. I got my pulley the next day. 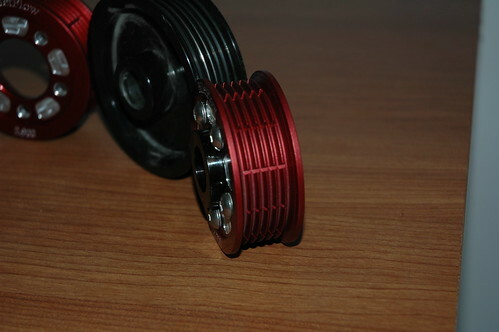 what do you mean when using the words non slip .....Interchangeable Non-slip Supercharger Pulley. WTB many lsj bolt on parts.